The Grande Forge Cast Iron Balustrade Line offers the discerning interior designer another option for finely decorative balustrade systems. Therefore, with its range of contemporary and also traditional designs, you will surely find the exact baluster design for you. 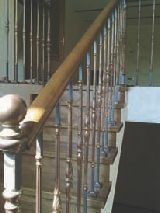 There are a number of pre-finished baluster designs, along with the full range to achieve what you want. Grande Forge have created a unique concept of its kind. Mass production of handicrafts. If the idea is about designing a cast iron piece, it goes to the expert hands of a master sculpture. Furthermore, the artist sculpts the model with an inborn dexterity. Which is specifically rather rare today. Grande Forge Cast Iron Balustrade Line offers the discerning interior designer another option for finely decorative balustrade systems. Grande Forge has created a unique concept of its kind. Mass production of handicrafts. If the idea is about designing a cast iron piece, it goes to the expert hands of a master sculpture. Furthermore, the artist sculpts the model with an inborn dexterity, specifically rather rare today. Even more, the company is a world leading manufacturer of many types of balustrade systems. These systems range from more contemporary balustrade design that will harmonize with any modern home, all the way through to the Grande Forge Cast Iron Balustrade Line. However, whether you are a professional designer or an end user, Grande Forge also offers you unlimited opportunities. Therefore, to incorporate these traditional and also modern styles into special settings!